When is Parc Aventura opened ? During the summer season, Parc Aventura Brasov is opened every day, including the week-ends, holidays, bank holidays and religious holidays, from 10:00 to 20:00. On the winter time, from December the 2nd 2016 until February the 28th 2017, Parc Aventura Brasov is opened only Friday - Saturday - Sunday from 10:00 until the sunset. For the school holidays of February 2017, we are open daily 10:00 - 17:00 from the 4th to the 12th of February. Is Parc Aventura opened during the rainy days ? Yes, the park is opened during the rainy days. For security reasons it will be partially or completely closed during the storms (lightening and bolt), strong wind or heavy rain. How much time can we spend in Parc Aventura ? 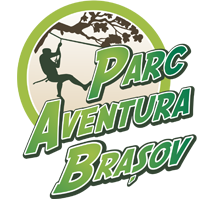 The entrance fees represent (3) three hours of adventure at Parc Aventura Brasov. If you stay more than (3) three hours, you will be charged with an additional fee acording to the tabel. During the 3 hours you can cross different routes (more or less difficult). Routes duration is between 15 min. and 1 hour, according to the difficulty range, the number of other participants and your personal agility. Is this activity accessible to everyone ? The minimum age is of 4 years old on the continuous belay routes (routes with security system without carbineers manipulation) and of 8 years old for the routes with self-insurance (routes with carbineers manipulation). The activity in Parc Aventura requires physical and mental skills which allow an independent practice. The maximum weight is of 110kg. This activity is not recommended to pregnant women. Can i let my child alone in the park ? A child of 14 years old can enter and evolve by himself on the designed route for her/his category. Children younger than 14 years old must always be accompanied by their parents or by a responsible person with a minimum age of 18 years. Do i get a personal trainer practicing the routes with me ? No. Once you get your a ticket you have to read the regulations and be equipped by our staff. Afterward, you will assist to a demonstration about the use of the safety equipment and how to behave in the park. After this 12 minutes training, you will perform on your own but you get get assistance of our staff at anytime. What happens if you get stuck in the middle of the track ? At your request, our supervisors will guide and help you as quick as possible. In case you are exhausted or you just do not wish to continue, you will climb down with the help of a ladder and / or a rope attached to a pulley system. Can I use my own equipment ? No. Our equipment is verified and is perfectly adapted to all routes, zip-lines and jumps. Should i book my visit in Parc Aventura Brasov ? I have to do the training every time I come to the park ? Yes, every time. As a frequent users you will be an exemple for others. The rules apply to all. Yes, debit and credit cards are accepted. Is it possible to organize birthday parties ? Yes. Think about the weather. It is an outdoor activity and you are in a forest... We have a bar / truck-food with hot-dogs, burgers, chips, chocolate, smoothies, coffee, soda, water, ice cream. You can bring your own birthday cake and pastry. Picnic places are available outside the park. Can I come with a dog ? Is there a restaurant in the park ? Well there is no restaurant but we have a bar / truck-food with hot-dogs, burgers, chips, chocolate, smoothies, coffee, soda, water, ice cream. The bar’s program is the same as of Parc Aventura Brasov. Is it a dangerous activity ? I am aware that adventure activities involve risks, dangers and hazards including, but not limited to: changing weather conditions; limited visibility, including darkness; mechanical failure of the equipment; difficulty or inability to control one’s speed, direction, stopping distances, falling trees, limbs, and ice; falling from platforms, cables and bridges; shock, stress or other injury to the body; encounters with wildlife including bears and wild dogs; equipment malfunction including breakage of cables, tethers, pulleys and harnesses; collision with trees, vans, or other vehicles, equipment or structures; collision with other participants or guides or other natural or man-made objects; the failure to remain within designated areas; becoming lost or separated from guides or other participants; negligence of other participants or guides; and NEGLIGENCE ON THE PART OF THE RELEASEES, INCLUDING THE FAILURE ON THE PART OF THE RELEASEES TO SAFEGUARD OR PROTECT ME FROM THE RISKS, DANGERS AND HAZARDS OF ADVENTURE ACTIVITIES. I am also aware that these risks, dangers and hazards referred to above exist on terrain that may be uncontrolled, unmarked and not inspected. Communication in the remote terrain, which is sometimes used for adventure activities, is difficult and in the event of an accident, rescue and medical treatment may not be readily available. My child is 8 years old and not very brave, can he/she use the routes for small kids ? We offer 4 routes for children between 4 and 7 years old. These routes are designed exclusively for small kids who wish to stay between them and not beeing stressed by other more mature children, teenagers or adults. My child is 5 and very sporty. Can she/he access the routes for 8 years old ? No. For children 8 to 11 we offer 6 routes on wich adults and children can progress together. The safety system has to be self operated from the participant. This requires a great deal of attention and skill that a small child has not yet developped.